The KLIM Cool + is the new version of the KLIM Cool. 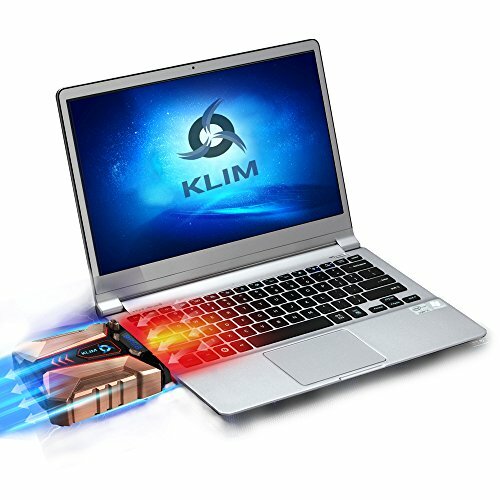 Constituted of 75% of high quality aluminum, and equipped with a new japanese motor, the KLIM Cool + is currently the most efficient laptop cooler on the market, lowering the temperature on average by 20.8°c. This temperature decrease is the difference between a laptop with performance issues and a laptop at peak performance. It can also be the difference between a laptop out of service within 3 years and one that will last you many more years. .
Amazon's 30-day return policy, return it for a full refund. Our 5-year warranty. A 5-year warranty is quite rare in electronics, it's a testament to our dedication towards our customers. We count on the loyalty of our customers and do everything we can to solve any issue you may have. ✅ MAXIMISES THE LIFESPAN OF YOUR LAPTOP. Overheating is the n°1 cause for laptop failure and performance issues. This vaccum laptop cooler is an investment => no overheat of the laptop's components => maximises the laptop's lifespan. Save your laptop from an early death. ✅ THE MOST EFFICIENT ON THE MARKET. The KLIM Cool + one-ups its older brother the KLIM Cool. With a slightly increased size and a faster fan the KLIM Cool + is 20% more efficient. It has a maximum rotation speed of 4500RPM (fastest in the world). Its metal structure acts as a heat sink, maximising its effectiveness. Average drop in temperature of 20.7°C in our labs test. ✅ A TANK + WARRANTY. When you hold the KLIM Cool + in your hands, you will feel the quality. It is built to last. Its structure in metal sets it apart from the rest of the market and makes it extremely resilient. The KLIM Cool + is equipped with a japanese motor in order to give it an exceptionnal lifespan. Warranty of 5 YEARS, rare in electronics. If you don't get the desired results, you just have to send it back to get a full refund. It's a risk free purchase! ✅ COMPATIBLE WITH MOST LAPTOPS. Our cooler is an innovation, therefore compatibility can be a concern. You have a side or back air exhaust? If yes, it is compatible. We include 4 sleeves to fit the air exhaust as best as possible. The size for the laptop has no importance (10 11 12 13 14 15 16 17 18 19 inches). It remains very easy to carry, weighing only 255g and fitting in your pocket. ✅ ONE NEGATIVE POINT. We want to be honest with our customers. The KLIM Cool + is perfect on flat surfaces (desktop, table) but due to its weight it puts additionnal pressure on its fixation system. If you plan to use it on non-flat surfaces the original KLIM Cool will be better meet your needs. If you want to obtain maximum cooling while you play or work, you won't find anything better than the KLIM Cool +.